While the world still has hotspots of (relatively) untouched island getaways, the environmental effects of tourism are slowly adding blemishes to the sheen of these immaculate islands.The SoelCat 12 could be a solution. Ahh, the island paradise. With its turquoise waters, sand the texture of talcum powder and warm, temperate climate, who wouldn’t want to getaway from it all to a place like this? While the world still has hotspots of (relatively) untouched island getaways, the environmental effects of tourism are slowly adding blemishes to the sheen of these immaculate islands. Tourism is fantastic in that it boosts the economy of an island nation, but the sad irony is that as more people arrive, the more pollution increases. Bora Bora in French Polynesia is atop the wishlist of many looking for an island holiday, and the Ministers of French Polynesia are fully aware of the environmental effects that come with increased tourism. 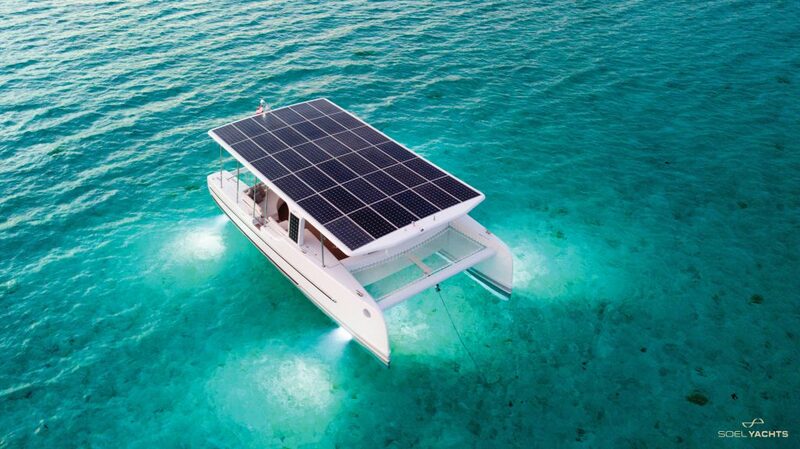 With an eye towards sustainability, the government of French Polynesia have introduced a privileged tax exemption to the SoelCat 12, a fully solar electric catamaran designed by Soel Yachts. The SoelCat 12 is a completely electric, noise-free catamaran that can achieve up to 14 knots on the seas. When not in use, it turns into a powerful solar-station that can supply up to four households with 15kVA inverter power. The Bora Bora Pearl Beach Resort has embraced the SoelCat’s power potential, powering its desalination plant through the SoelCat 12 and can produce up to 4000 of fresh water every hour – eco-sustainability at its finest. The sleek design is not just for show but built for maximum energy efficiency and conservation. Compared to the regular demands of gasoline powered motorboats, the SoelCat 12’s consumption is the equivalent only 0.22L of gasoline per nautical mile. Pollution has very real effects on island nations, often irreversible. It’s great to see French Polynesia understanding the brevity of the situation and leading the charge with its eyes firmly set on sustainability and preservation.